Cuomo's win means another term for Lt. Gov. Kathy Hochul as well. Andrew Cuomo easily won his third term as governor of New York on Tuesday night, wrapping up a campaign season with contentious challenges in both the primary and general election. Cuomo defeated Republican challenger Dutchess County Executive Marc Molinaro, with 59.02 percent of the vote to 36.79 percent of the vote and 99.4 percent of the polls reporting. The Associated Press called the race in favor of Cuomo around 9:01 p.m., just 1 minute after the polls closed. Third party candidates Howie Hawkins, Stephanie Miner and Larry Sharpe had 1.69 percent, 0.9 percent and 1.6 percent of the votes, respectively, according to the AP. Cuomo’s win means another term for Lt. Gov. Kathy Hochul as well. 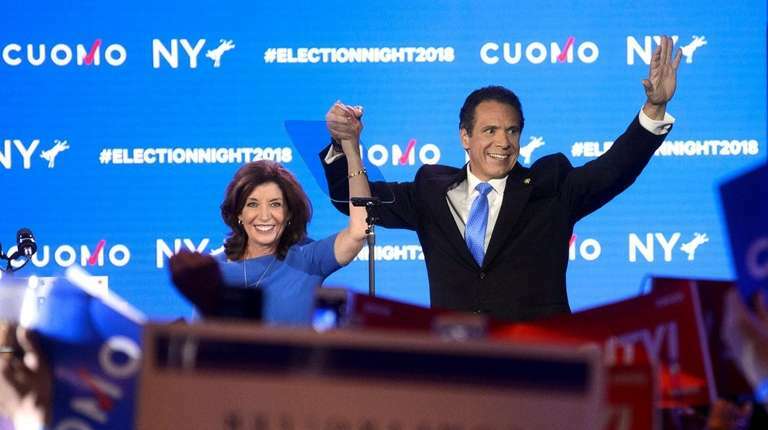 The winners of the state’s primary election run on one ticket together, so a vote for Cuomo on Tuesday was also a vote for Hochul. The governor celebrated his victory at the New York State Democratic Committee’s election night watch party held at the Sheraton New York Times Square Hotel with a speech that largely targeted President Donald Trump. "We are not a nation of red states or blue states, we are a nation of red white and blue states," Cuomo said. "Mr. President, you have underestimated America's better angels because what binds us together is stronger than what divides us because at the end of the day love is stronger than hate." The festive crowd also included Democratic faithful from around the city. Christine Quinn, the executive chair of the state Democratic Committee, said she was "blown away" by the massive voter turnout in the city. "I’m really thrilled people stuck it [out] and stayed there and voted. But they shouldn’t have to. Voting should be an easy part of people lives on Election Day and not a day they have to take off from work," Quinn said, referencing widespread issues with ballot scanners in New York City on Tuesday. Cuomo now joins his father, the late Mario Cuomo, in leading the state of New York for three consecutive terms as governor. While critics on the campaign trail raised questions about what his priorities would be in the next four years, Cuomo held fast to a winning strategy, touting his record in governing and positioning himself as the antithesis of Trump. Molinaro tried to chip away at Cuomo's commanding lead in the polls by painting himself as a problem solver who would clean up malfeasance in Albany and fix New York City's crumbling subway system, among other key platform issues. Ultimately, it was not enough to compete with an incumbent Democrat in a state where Democrats outnumber Republicans by more than two to one. The campaign season also ends with Cuomo positioned farther to the left on key issues, like marijuana legalization and criminal justice reform, than he was a year ago – which experts have attributed to progressive primary challenger Cynthia Nixon. Cuomo comfortably defeated Nixon in the primary, but the governor likely won’t back away from some of his more liberal policies. On the legalization of recreational adult use of marijuana, Cuomo has already ordered a work group to draft legislation for the state Legislature to consider as early as 2019. Election Day marred by broken scanners across the cityWet weather was blamed for the problems that caused long lines at polling sites.